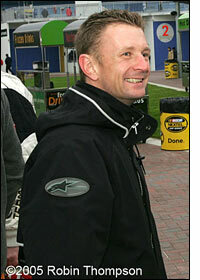 It definitely wasn’t a ‘done deal’ at the time of the Daytona test days, but it’s definite now: Allan McNish will be racing in the Rolex 24 this coming weekend, at the wheel of the #2 Howard-Boss Motorsports Crawford Pontiac, with Danica Patrick and Rusty Wallace. The fourth driver has been confirmed now too - Jan Lammers has been invited to join the crew in #2. Support comes from Callaway Golf. Ol’ Rusty was probably a little ‘previous’ in announcing his partners a couple of weeks ago (Boris Said was going to be the fourth driver, but now isn’t), but it’s all confirmed now. McNish gets his first try in a DP – and it’s his first time at the Rolex 24 since 2001. He was just an interested spectator at the event a year ago (left). He set the fastest lap of the race then (1:41.875), in the Risi Competizione Ferrari 333SP, but he, Ralf Kelleners, Eric van de Poele and David Brabham retired with engine trouble after 15 and a half hours (462 laps). It’s a very different race now. “It’s the first time I’ve ever shared a racing car with a lady,” says the Scot, “but Danica showed by leading the Indy 500 last year that she is very accomplished and talented - she could be the ‘lucky charm’ I’ve previously been missing at Daytona! Steering clear of trouble looks like being the key to success at this race, more so than at any other 24 hour event – with over 70 cars likely to start, over 30 of them being DPs. 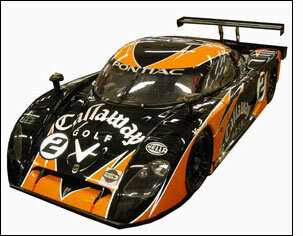 You'd be hard pushed to find two more experienced endurance racers than McNish and Lammers to lead a line-up at Daytona - so we'll contradict the Dutchman and predict that this entry, in its distinctive livery, is a potential winner. 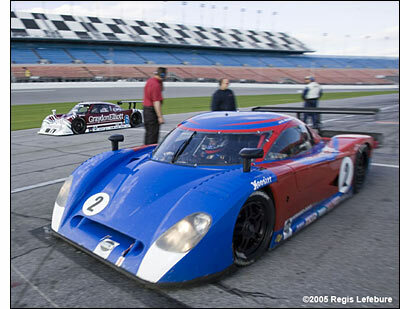 The Scot's next race in North America, after Daytona, is expected to be the Sebring 12 Hours, in one of the Audi R10s. His first experience of a DP will be on Thursday, at Daytona International Speedway. Jan Lammers came close to being a Rolex winner last year, in one of the Crawfords - but is a former double race winner of the event anyway, dating back to a different era (1988 / 1990) at Daytona International Speedway.